One of my favorite food memories from visiting WDW is watching Kitchen Kabaret, the original food and nutrition show put on at EPCOT Center’s The Land pavilion. 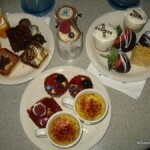 This audio-animatronic showcase of “edible” delights had funny jokes, catchy songs, and a healthy premise, but what I liked most about it was that there was so much to look at and anticipate. The detail of the animatronics was incredible; the variety of the songs was broad; the characters were actually pretty well developed for only being on stage for a couple of minutes. It was just a very well done show. Ah, Mr. Dairy Goods and his Stars of the Milky Way, The Cereal Sisters, Hamm ‘n’ Eggz, Colander Combo and the Fiesta Fruit — we miss you. You can find a great write-up about the attraction on Widen Your World, and the videos of the show are below. I haven’t seen this, but I do remember Food Rocks! and I’m sad they got rid of it. I missed this attraction very much. It was such a disappointment when “Food Rocks” came along. I just uploaded a picture I took a couple weeks ago at One Man’s Dream to the DFB Flickr page – it has the broccoli AND the tomato plushes! So funny – that is exactly what starting singing in my head when I saw the picture!!! Veggie Fruit Fruit! Veggie Veggie Fruit Fruit! I love the postcard graphic that opens the piece! I enjoyed Kitchen Kabaret . . . It helps that Soarin’ is one of my favorite attractions in WDW. Wow, those really are some great designs and animatronics! 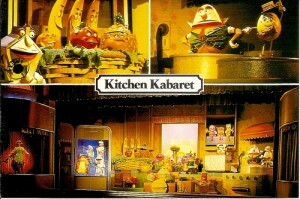 What years was the Kitchen Kabaret at Epcot for? No one has ever said a word about it, even the folks I know who work at Disney. I loved this and miss it. I’ve watched the youtube videos in the past and am really thankful that someone taped it. 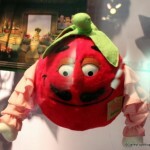 I still have a Mr Tomato pin from back then. Ahhhh…memories. Betsy — Ha ha! You had the broccoli plush! We should get the whole band together! Sarah 911 — Off to check out the flickr page now! John G — More reason for me to go find that youtube vid! Josh — It was definitely old school! I’m not 100% sure when it closed down to install Food Rocks! — that Widen Your World link will have the answers, though. Lynne — I am also SO thankful to the forward thinkers who video-ed these way back when! Lori — Have a great time in Disneyland! Thanks for stopping in to the DFB to say hi! I loved this. 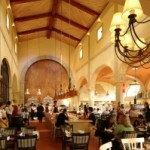 I’d enjoy seeing more articles like this about food related attractions. You know, this, Living with the Land… um… I’m sure I’ll think of something else. Oh, maybe how they feed the animals at the AK or something. But honestly, I’d love to see more about how food, eating, and edible landscaping is used in the theme parks outside of the resteraunts. Keith — Everyone together now! GG — Agreed. I know Erin Foster has put together a blog about the Behind the Seeds tour at the Land for the Disney Food for Families column; we’ll post that one soon. I agree with you 100%, though, and I’d love to spend more time learning about the edible landscaping and greenhouse growing happens in Epcot. 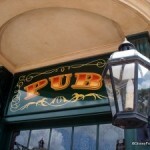 AJ – This nostalgic look back at something at WDW that is gone, makes me think that a fun post would be to have us all comment (and lament) on restaurants or bars that are no longer in existence but would be fun to remember. KK is still one of my husband’s all time favorite Disney attractions. He just bought a broccoli plush off ebay to replace the one he had as a kid! This is awesome! I had the stuffed tomato, broccoli and eggplant. I wonder if they’re still somewhere packed away. Hubby just watched the video with me and I was singing along – he gave me the look like I had gone nuts.